I honestly don’t even know where to start. New York is just one of those places that you’ve always heard about. Always dreamed about. Movies and television shows are always filmed there. I mean, Spider-Man lives there for crying out loud! No one could ever believe that I’d never been to New York. You’ve been all over the world but you haven’t been to New York??? No people, somehow it just never happened. Calm down. The food was pretty awesome too. We had some finger licking good duck in Chinatown. I absolutely had to have a hot dog in Central Park. And of course….. there was pizza…..
Sweet mother of all that is good and pure! The pizza! And it’s everywhere!! Literally, on every block! If you’ve read some of my other posts, you know I LOVE pizza. And guys, let me tell you. New York is the mothership for pizza lovers. We even had pizza at Lombardi’s, the first American pizzeria. Oh! And another interesting part of our trip was the fact that there just happened to be a frickin blizzard. And not just any blizzard. They were predicting it was going to be a “historic” blizzard with two to three feet of snow. In preparation, they even shut down the subway system (the first time ever in its 110-year history). So what did we do? We went to Times Square to take pictures and play in the snow. We also got to sit in on a taping of the Late Show with David Letterman. We happened to be walking by the studio and they needed people in the audience. I guess because of the blizzard not as many people had shown up. I’ve never been to a taping of anything, so it was pretty cool. The big bad storm ended up not being so bad after all. Even though thousands of flights were canceled, ours was not one of them; our flight left right on time. We were told, actually, that our flight was the first to leave LaGuardia that day. Even though, if our flight had been canceled, I wouldn’t have been too upset. Who wouldn’t mind staying an extra day in New York, right? Very different New York I saw…summer 2012. Times Square sure looks different! 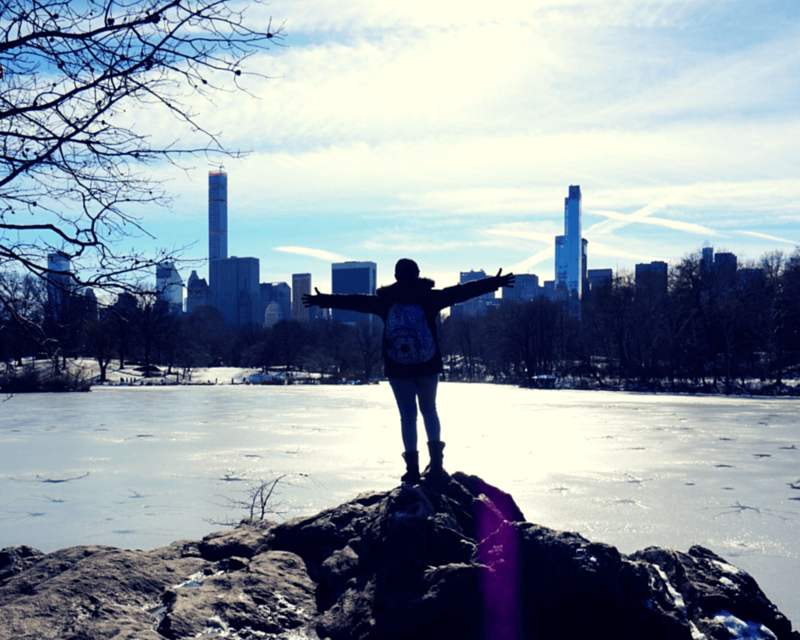 There’s so much to do and see in New York! Next you have to check out a show on Broadway. I love that you managed to eat both hot dogs and pizza! Congratulations on finally making it to my hometown of NYC! I’m so happy you had a great time! Right now,we’re living with family in NJ in preparation for our full-time travel plans starting in July. Prior to this year, I’ve lived a 3 blocks away from Lombardi’s for almost 20 years, right in the intersection of Chinatown and Little Italy. So happy you got to eat roast duck, I wonder where you had it? Luckily, you were able to leave when you did because now, all that snow has become disgusting black ice and slush. Such a fun post! OMG Brenda, if I lived blocks from Lombardi’s I’d weigh 300 pounds! If I had been in New York I would have booked it to Central Park to go tobogganing! Snow just makes everything including NYC more beautiful! Great post and photos! How embarrassing is it that I’ve literally lived less than 3 hours from NYC most of my life and never went? Yeah Oops. It’s one of my dream trips, though! Glad you got to go and that the snow storm wasn’t as terrible as expected! Hi Sky! I think that happens to a lot of people. Something that is so close often gets overlooked or you keep thinking “It’s right there, I can go whenever” but then you never go. You should definitely take a weekend trip! I haven’t been to NYC yet either . . . I’m hoping to go over the holidays this year! That last photo is amazing! Hi Alli! I hope you get to go! And thanks! I’ve been to NYC in the summer, but I’d LOVE to visit in the winter, especially during Christmas! That’s awesome that you got to go to a taping of Letterman! I’ve watched him basically since I was born, always been a fan. I live in Brooklyn. While you were happily watching David Letterman, I was happily home in my pajamas on my couch because no subways = no work YAY SNOW DAY!